FIFA 14's official product page admits "no updates to gameplay or game modes" from its predecessor. We all joke about how the yearly installments of EA's sports titles are virtually the same game, but in the case of the 3DS version of FIFA 14... that's actually pretty much the case. In the latest update to the Nintendo eShop, a product description for FIFA 14 Legacy Edition appeared, which states that while the game has been updated with the latest rosters and kits of this year's soccer season, it doesn't actually offer any updates to gameplay or game modes. "FIFA 14 Legacy Edition delivers unmatched authenticity that reflects the current football season with updated kits and rosters but no updates to gameplay or game modes." So, what would you expect to pay for what is essentially a DLC pack that changes some players around? $5? Maybe $10 if you're a real die-hard soccer fan? Certainly not the $39.99 that EA are asking for FIFA 14 Legacy Edition. "It features 30 officially licensed leagues, 50 real-world tournaments, and 500 authentic clubs. Play traditional matches or free your game in epic 5-v-5 street matches with 3D effects. Play as a real-world superstar or re-create yourself. Optional touch screen controls deliver pin-point shooting and passing at your finger-tips," the product description continues. This isn't the first time EA has been accused of being lazy with its sports games, as it was previously revealed that the PS Vita version of FIFA 14 would also be the exact same game with roster updates. 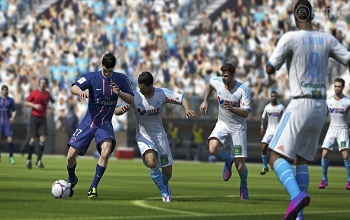 Are you a dedicated enough FIFA fan to buy the same game twice, just to be fully "up-to-date" with the latest rosters?